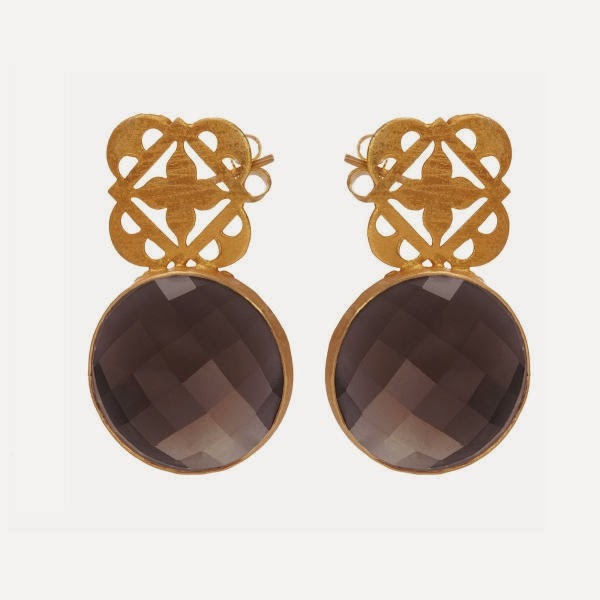 On the eleventh day of Christmas, Domestic Sluttery gave to me... a gorgeous pair of smoky quartz earrings! Do you open your Christmas presents in order of size? Put them in a little pile and then start with the little ones and leave the biggest one until the end? I do. The bonus with doing this is that some of the very tiny presents might have jewellery in them! 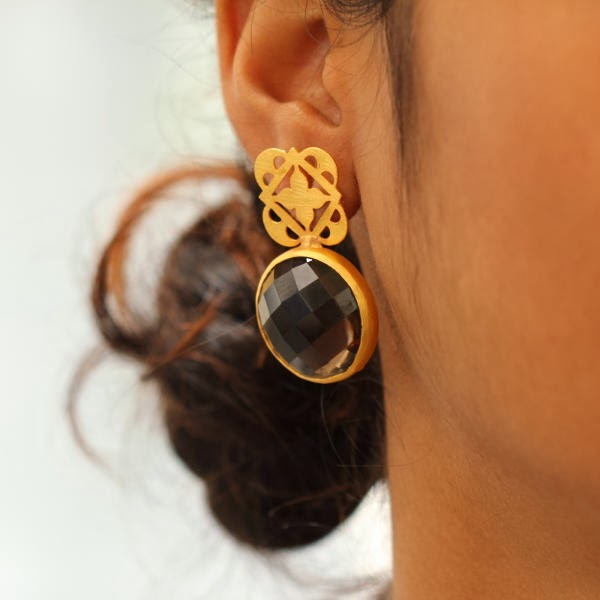 If you're lucky, one of them might be from Kasturjewels, a London-based designer on Boticca (aka, my favourite place to be beautiful bling from around the world). Leave a comment below telling us what you're wishing for this Christmas. Are you hoping for a holiday? A chance to read all of those books that are piling up? Or maybe a little bit of time to spend with your family? Yes, you are definitely allowed to wish for a unicorn. Like us on Facebook and then like or comment on our Facebook competition entry. It'll go live in a minute, our tea has gone cold and we need to make some more. Sign up to our newsletter using the box on the right. You'll get a £60 wine voucher when you do, regardless of whether or not you win! We'll pick a winner at random and announce in the final competition tomorrow. Good luck everyone! PS - itching to find out who won the £50 voucher from Shoes International? That was Amaryllis Heloise Gregory! Amaryllis, just drop us a line via email or Facebook and we'll arrange your prize. Oh goody! Small print (please read it). The competition will close at midnight (UK time) 16 December 2013. You can enter wherever you are in the world, come on overseas readers! If you're anon, your comment entry won't count and if you enter with lots of comments or a barrage of Facebook comments and tweets, we'll discount all of your entries and tell you off. The winning entry will be chosen at random and you must claim your prize within 48 hours otherwise we'll pass it on to someone else. We're not allowed to enter our own competitions but Siany is wishing very hard for a little bit of quiet (without an internet connection) so she can hang out with her parents and eat mint Viscount biscuits. Those are lovely! I would love Beyonce tickets for Christmas, alas they're all sold out! I'd love a holiday but will settle for a decent night's sleep! Oh they're lovely! I'm hoping for time to tackle my pile of books that are waiting to be read and reviewed. It's currently threatening to take over my flat, so fingers crossed it's a lot smaller by January..
Peace and love for all etc....but...really? A visit from Barry Gibb, Beyonce tickets and ALL THE SLEEP. For Christmas I want my body clock to sort itself out and stop waking me up at 3.30am! I'm wishing for a new sewing machine! Lovely! ^^ For Christmas I'm hoping for some more time with my family and loved ones... also, time to arrange my pictures in pretty albums, they've been stacked in a box since, well, way too long. A unicorn would be excellent! Otherwise I'll settle for having a day off from my final year assignment that's due on New Year's Eve! I'm wishing for lots of pub time with old friends, and a chance to get some serious crafting done! Failing that, I guess several festive woolly jumpers would do the trick! I'm wishing for a car that works and a magic fairy to pay for my wedding! Somehow I think I'll be sadly disappointed next week! Nike X Liberty print trainers, size 5, the navy bluish ones, pleasepleasepleaseplease Santa. I'm wishing for snow! A lovely white Christmas and a chance to build a proper snowman. Drizzly Christmas just isn't the same. I'm wishing for a DAB radio so I can stop trying to balance my laptop next to the stove in my tiny kitchen as I cook, but a day of food, drinks and festive frolics with the ones I love is going to be marvellous either way!! I'm wishing for sleep - cancelling several days of holiday to work, combined with construction on our road (8am noisy starts on a Saturday?!) are making me very tired. I'm wishing for a romantic, cozy Christmas by the fire, with plenty of cheese. I'm wishing for my 3 year old cutie pie cousin to be right, my dad is now indeed in the sky with santa! Nothing extravagant, just for my grandma to keep recovering after having 2/3 of her lungs out and be able to join us for Christmas. I'm wishing for the nice producer who said they'd read my script to say, 'yes. yes, yes!' and shower me with offers I can't refuse... and/or NOT putting on a couple of kilos from eating all the Crimble goodies would also be for the win!